Never, ever SWYPE if you're me. I text a lot. It's convenient and non-intrusive and it's become the primary form of communication that works for me and the majority of my friends and family. Except that I have a very smart phone (it's a Samsung Galaxy) and it's apparently a lot smarter than I am. Also, it enjoys messing with me. And now there's this new thing I can do called "swype". Basically it means you glide your finger around the touchscreen and the phone figures out what word you meant to type, as if by magic. About 90% of the time, it works perfectly and I love it and I think I have forgotten how to text the old fashioned way. When "nerf guns" become "beef hound". Lydia: My kids are out of control crack heads running around my house right now. Kristin: Mine too. Maybe something in the air? Lydia: I just got shot multiple times in the haunches with beef hound. Lydia: It's a good thing beef hound don't hurt. Lydia: CRAP. Not beef hound. NERF GUNS. Kristin: I am laughing so hard at you right now. Kristin: OH DEAR GOD. Don't google image search beef hounds. Just don't. Don't don't don't. I was not expecting that. I tried to text the word "f*ckers" and it changed to "giblets". Lydia: What happened with those people? Lydia: They are giblets, man. That's not OK.
Kate: Its OK. They're giblets. Here I am, winning big lady night. And then "Last night" somehow became "Lady Night". Lydia: I am so tired and I forgot that I have like $30 in singles crammed in the pockets of these jeans. Guru: What the hell? Another late night working at the club? Lydia: Lady night was Bunco. And I won big lady night! Guru: You won big lady night? Lydia: What's big lady night? Guru: I DON'T KNOW. That's why I asked you. Lydia: GAAAAHHHH!! My ducking phone is a giblet! I meant LAST NIGHT. At Bunco. 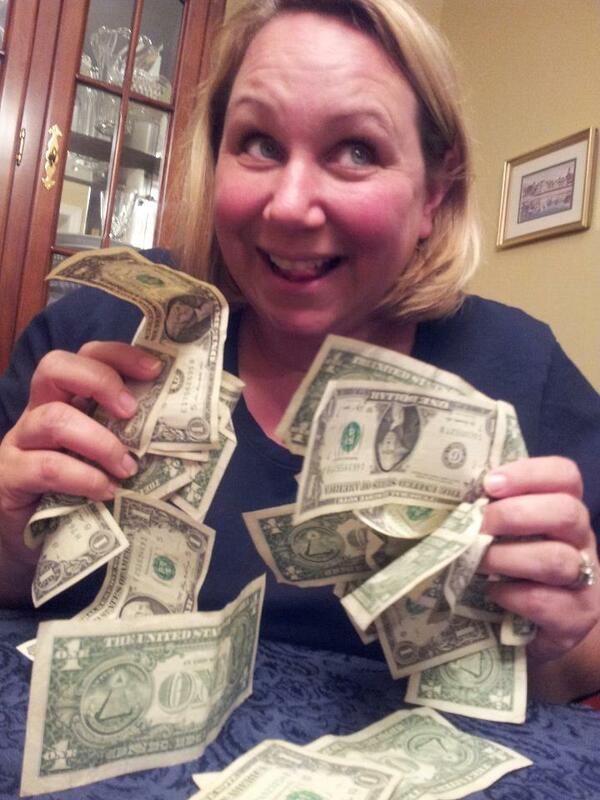 I won big at Bunco last night. Stupid phone is STUPID. Guru: No. Not the phone. "Okey dokey" becomes "Pokey Doherty"
Cap'n Coupon: I have to go to Michigan on Wednesday. Is that going to be OK? Cap'n: Who is Pokey Doherty? Lydia: What the hell are you talking about? Cap'n: Read your text, genius. Lydia: Oh dear. I meant OKEY DOKEY but my phone is a stupid head. Cap'n: I don't want Pokey Doherty in the house while I'm out of town. It's not Saturday, it's "asstray". Guru: When are you going to go apple picking, woman? Lydia: You asked when. I said ASSTRAY. Lydia: Oh. Not asstray. Saturday. Lydia: I hate you phone. I hate you. Guru: I love your phone. Never get another phone ever. And when I tried to text: "You got it, hotstuff" it inexplicably became "You go, Gustav". Try explaining that one to your husband after the whole Pokey Doherty fiasco. Cap'n Coupon: Hey, I'll be home early. Do you want me to take you guys out for dinner? I will even take you to Spartans. Cap'n: Lydia, what are you doing? Lydia: I meant to say YOU GIT IT, HOTSTUFF. Lydia: Crap! YOU GOT IT, HOTSTUFF. Cap'n: Maybe you should stick with yes or no. Cap'n: And Gustav is not invited to dinner at Spartans. Lydia: No. I mean yes. And that's why I should never have a smart phone or send text messages.